28th All India full contact karate tournament &won prizes and awards was held in Tamilnadu India on 30th～31st December 2017. The 28th All India Tournament was held in Tamilnadu India. Birthday of Prophet Muhammad (PBUH) organized by Milad Committee Lahore . Sensei Mazher Elahi, Amjad Prince, Qasim Ali, Sheikh Tariq Ali. Children’s tournament “Little samurai-2017″ was held in Tyumen Russia on 17th December 2017. Winter camp was held in India. Dan test was held in Nepal. Ukrainian Open Kyokushinkaikan Karate Cup among children and juniors was held in Brovary on December 10, 2017. Ukrainian Open Kyokushinkaikan Karate Cup among children and juniors was held in Brovary on December 10, 2017. More than 300 fighters from many regions of Ukraine came to Kyiv region this year. Sportsmen fought in 30 categories. Main organizer of the competition was Ukrainian Kyokushinkaikan Karate Federation. IKO Matsushima Indonesia IKKA held a Dan test on Sunday 10 December 2017 at our main dojo, in Banten. Participated by seventeen members including six from Surabaya ( East Java ) and two from Padang ( West Sumatera )who graded to Sho Dan till San Dan. The grading started at 9:00 and finished at about 16:00,also attended by other black belt holders who gave their support from start till end. Participants from aged 12 to 64 went through the test in their best effort. On December 10th was held the third annual Kyu Test at IKO Matsushima Northern Area with the participation of 17 students from age 5 up. Children and adults gave all the tests required to qualify and obtained the new Kyu/belt. 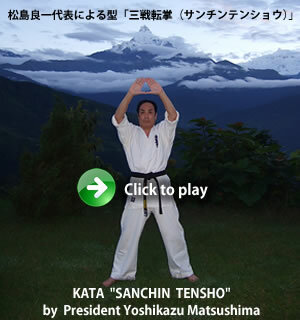 Parents encouraged for more than 3 hours their kids to achieve and complete all the requirements asked including “Tameshiwari” and “Kumite”. A two day seminar was given by Shihan Klaus Rex, president for IKO Matsushima Europe in Iquique- Chile on November 17 and 18 with more than 60 students of different grades and ages. High lighting a night class in Playa Cavancha – Iquique. 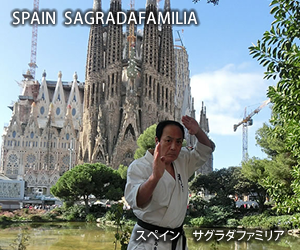 Students and parents participated enthusiastically of this major opportunity of having Shihan Rex in our city teaching and sharing his experience and Sosai Oyama philosophy and conception about Kyokushin Karate. 15th annual Durgapur winter training camp was held in West Bengal, India on 17th December 2017. IKO Matsushima Championship was held in Yerevan Armenia on 3rd December 2017. I.K.O.MATSUSHIMA Calgary branch was established officially.The report which new Dojo was opened at Calgary, AB, Canada. The I.K.O.Matsushima International Karate Organization Kyokushinkaikan Honbu Japan, KI Dojo, Karnataka, India. Conducted 3rd Belt Gradation and Belt Ceremony for Ki Dojo Karnataka, India Kyokushin Karate Students on 10th December 2017. It was very successful Belt Gradation & Belt Ceremony for Ki dojo Kyokushin Karate Students. Ｗinter school was held in Militol Ukraine on24～26thNovember 2017. IKO Matsushima Indonesia,Indonesian Kyokushin Karate Association held an all kyu test on Sunday 26 November 2017 at our main dojo in Banten province. 118 members took part and were separated in two groups,with children and beginners in one group started from 9:00 to 12:00 and another from 14:00 to 17:30. With events of 10th European Championships the Joint Training Seminar and Dan test were held at Santa Susanna. 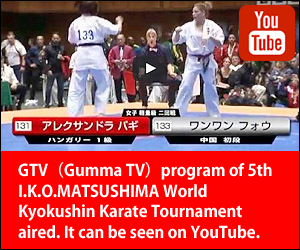 10th IKO MATSUSHIMA European Kyokushin Karate Championships was held in Santa Susanna,Spain on 28th,29th October 2017. The 13th Kyokushin China Open Tournament was held from 1st. to 3rd. October,2017, in Nanjing,China. Organized by IKO Matsushima Nanjing branch,attended by unsurpassed 913 fights , which included competitors from Russian Far East branch deputed by Sensei Alexander Udodov. Our tournament went through 3 days of tight compitition of kata and kumite . I.K.O.Matsushima Azerbaijan Championship was held on 9th Nov.2017 in Baku,Azerbaijyan. International Karate Organization Kyokushin Kaikan I.K.O.Matsushima Representation of the Republic of Azerbaijan 9 November 2017 In the regions of the Republic of Azerbaijan Masalli region and Gala settlement of Baku, I.K.O. Matushima Kyokushinkaikan Karate sports type tournament and events were held in the Republic of Azerbaijan dedicated to the National Flag Day. The eighth IKO Matsushima Indonesia interdojo tournament was held on Sunday 5 November 2017. Partcipated by 107 members who did Kata and Kumite in two separate arena. It lasted about 7 hours from 09:00-16:00. Kyu test was held in Tamilnadu India. Kyu test was held in Blagoveschenske Russia on 25th November 25. Belt Gradation and Belt Ceremony was held in India on 30th October 2017. Championship was held in Chelyabinsk Russia on 29th October 2017. Volyn region championship was held in Lutsk on 21st October 2017. The competition gathered more than 180 sportsmen. They fought in 28 age and weight categories. 5 categories were formed of sportsmen attending karate sections in kinder-gardens. All the winners were granted cups, medals and certificates. Finally, Shihan Dmytro Volynets presented black belts to sportsmen who have successfully passed accreditation tests in summer: Matkovski Serhii –2nd dan, Shevchuk Vasyl – 3rd dan. In its ninth version, participants from different regions of the country attended, concentrating cultists between 5 and 67 years of age. The 9th version of the National Kyokushin Matsushima Karate Tournament, organized by the regional academy Salinas Dojo, was held this Saturday, October 7th, with great public influx and great professionalism. On Saturday I went to Burnie in Tasmania for Dan grading. This was very historic as it is the very first time a Dan grading has been done in the town of Burnie.